A six member group who fancies themselves as the sound of Bangladesh !! It all started with two friends meeting at Shantiniketan , and there was no looking back . Band Bangla has been the one consistent voice for contemporary music in Bangaldesh. They blend the the tune of the Ektara with a very new touch. 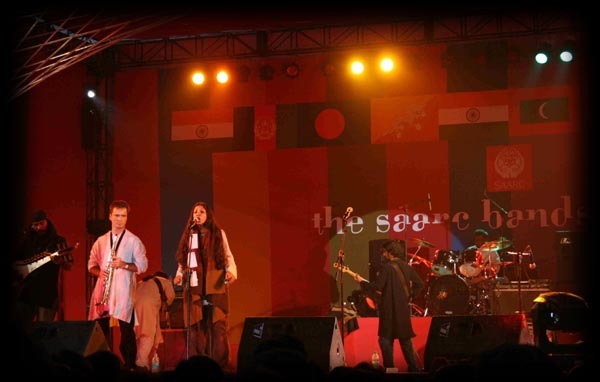 The band consists of Anusheh, Buno, Arnob, KArtik , Jibon, and Nazrul. Band Bangla has taken the sound of Bangladesh across borders. They have reached out to audiences internationally. They have played alongside great musicians like Jonas Helborg (Mahavishnu Orchestra), Pandit Tanmoy Bose, T.H. Vikku Vinayakram (Shakti), Silva Ganesh, Bob Geldof, Bono (U2), among others. They have successfully taken out two Albums named “ Kingkortobbobimuro” and “Prottutponnomotitto” Both epoch making Albums that have had landmark success . Band Bangla is a journey that’s continuously evolving with the creative process. And they fulfill every promise they make.